I've just traversed the state of Virginia again to pick up littlepeach#2 from her visit with her grandmother. 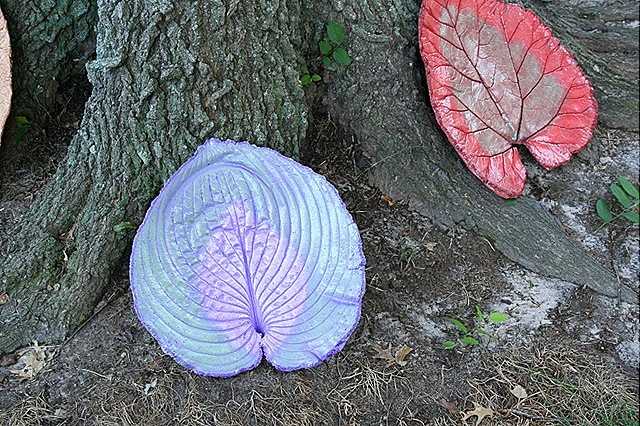 My mom as been busy this summer cranking out some more of her fabulous concrete leaves for decorating the garden. I brought a bunch back with me to sell here locally in Hampton Roads. 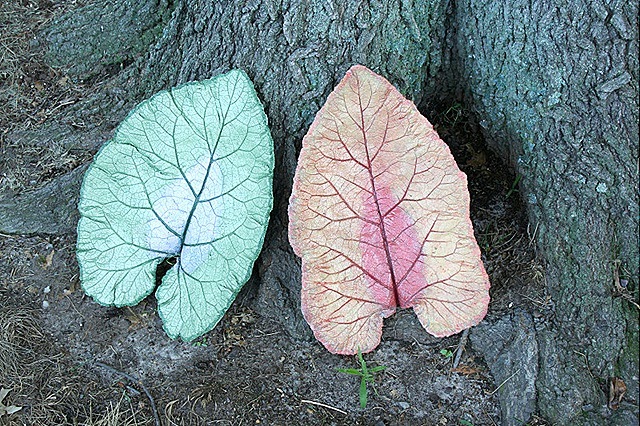 These are made using real leaves from her garden as the template. This is a rhubarb leaf. These leaves are quite large, 15 – 20 inches high. 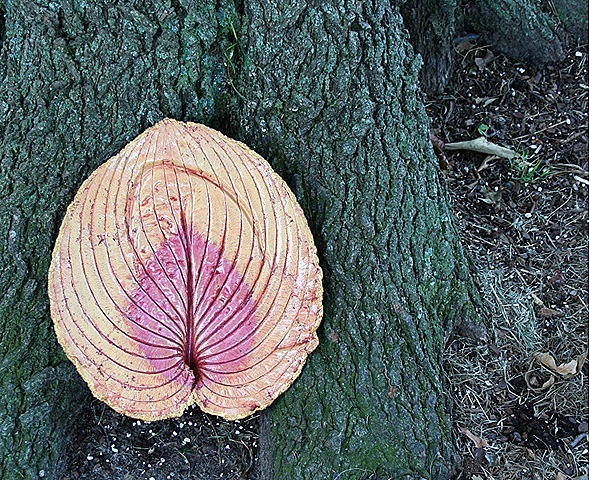 This is a large hosta leaf. I love the bright colors. 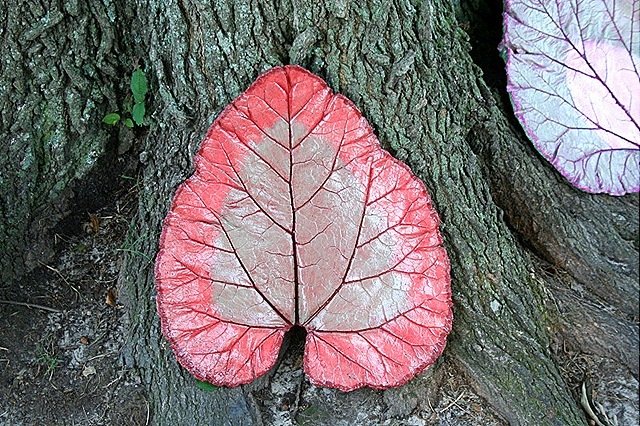 Each leaf is painted with concrete paint and then sealed. They will last forever and the colors don't fade. Yesterday while inspecting the garden I came across these two little guys in the golden larch tree. 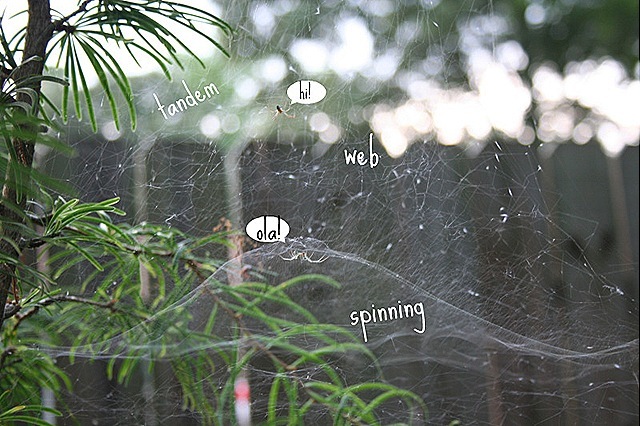 How odd that they spun their webs on top of each other! Those are beautiful! Artsy talent is obviously in the family! The leaves are so amazing! I love this idea! The leaves are beautiful. Is this a difficult thing to do? What a great idea. The leaves your Mom makes look great. How’s the compost tumbler going?? I love the leaves…are they too heavy to ship? Those leaves are just gorgeous! I never saw such beautiful leaves like these. Wow!!! I am so much amazed!!! Thanks for the post!! !